What is authentication of documents? You Are Here:Home/Authentication and Legalization Process/What is Authentication of Documents? Authentication of documents is not something you hear about until you need it. You are probably familiar with the more common form of the word authentication: authentic. If something is authentic that means it is real. Therefore, authentication is the process of determining if something is authentic, whether it be jewelry, antiques, hockey cards, or 100 dollar bills. Authentication of documents is no different. It involves looking at the signature and stamp of a certified individual on a document who verified that the document itself is authentic. This includes looking for things such as watermarks in the document that can only be seen when held up to a light source. Who can certify documents in Canada? 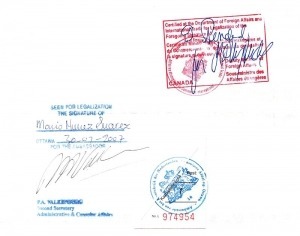 Other documents such as those given by vital statistics Canada such as birth certificates do not require notarization; they have their own special signatures, stamps, and watermarks that indicate they are authentic. If you are wondering if your document requires notarization to be authenticated, we can help. Click here to contact us. Once notarization has been done (if required) then the document is ready for authentication. This can be done both at the provincial level or the federal level at department of Foreign Affairs in Ottawa which is now known as Global Affairs Canada. Some embassies require provincial authentication whereas others require federal authentication at Global Affairs Canada. Furthermore, certain documents need additional specific requirements prior to authentication such as translations whereas others do not. This happens a lot more than you think and it can cause very serious delays at places like Global Affairs Canada. This can lead to months of waiting for your document to be authenticated since it takes Global Affairs Canada around 6 weeks just to look at your document. If there are any errors whatsoever it will be at least another 6 weeks until they see it again. When you use our service we make sure that these specific requirements are there and that there are no errors with any of the signatures or stamps on the documents and can have your documents authenticated in 1 day. 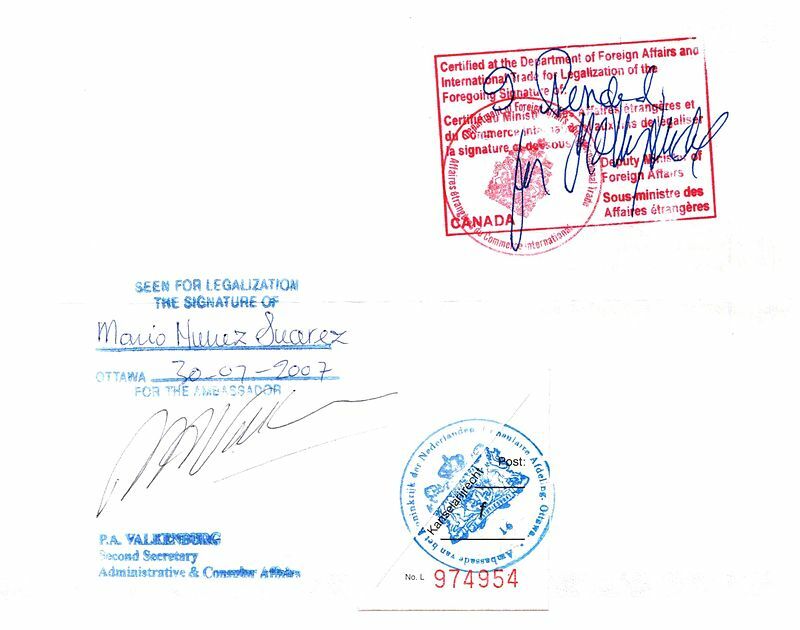 Once the documents are at Global Affairs Canada, the signatures and stamps on the document are checked by their professional representatives who have a record of almost every signature and stamp from notaries and lawyers in Canada. This allows them to verify that the signatures on the document are authentic and, by extension, that the document itself is real. Representatives from Global Affairs Canada or a provincial body will then place their stamp, seal, and signature on the document. This completes the authentication process and your document is ready for legalization at the embassy of whichever country the document needs to be used in. The answer is simple: to prevent crimes such as fraud. It is easy to forget that documents can be incredibly valuable. University degrees from prestigious universities, powers of attorney granting special privileges and property, death certificates granting inheritance are just a few examples of valuable documents. Because of their value, there is a large worldwide market devoted to making almost perfect illegal copies of these types of documents. The rapid development of technology has made these fake documents a growing problem in recent decades. However, original handwritten signatures and stamps cannot be easily copied and in many cases it is virtually impossible even with the best technology. This is why authentication focuses on signatures and stamps from credible individuals and why the process of document authentication is required. Click on the Get Started button below to have your documents authenticated in 1 day! By ALSC|2018-02-12T15:34:21+00:00April 10th, 2017|Authentication and Legalization Process|Comments Off on What is Authentication of Documents?